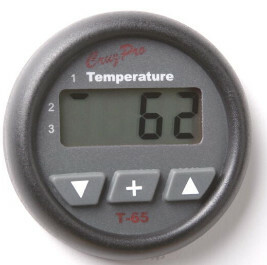 The CruzPro T65 digital temperature display continuously monitors three separate sensors and displays temperature from -20 deg F (-29 deg C) to +140 deg F. (+60 deg C). You can simultaneously monitor three zones such as bait tanks, engine room temperature, refrigerators, freezers, sea water temperature, inside cabin temperature, outside temperature, fish holds, battery temperatures, etc. The units of display is easily selected and individual high and low alarms can be set for each area. When activated, the built-in 85dB alarm buzzer will sound and the display will flash. The T65 is factory calibrated but can be user calibrated in the field for each individual sensor for spot-on accuracy. All set-up and calibration constants are saved to non-volatile memory. The T65 uses standard 10K NTC thermister temperature sensors (the type most often used in speed/temperature and depth/temperature transducers). Bronze thru-hull, plastic transom mount and zinc plated bolt-on temperature transducers are available separately. The T65 has variable five-level red backlighting for easy night-time viewing and works on both 12 and 24 VDC systems. The T65 is very easy to install, requiring only a 2-1/8" (55mm) hole saw and screwdriver to connect. The T65 outputs a separate NMEA 0183 serial data sentences for each temperature zone at 4800 BAUD on rear screw terminal pin "C" (see below). 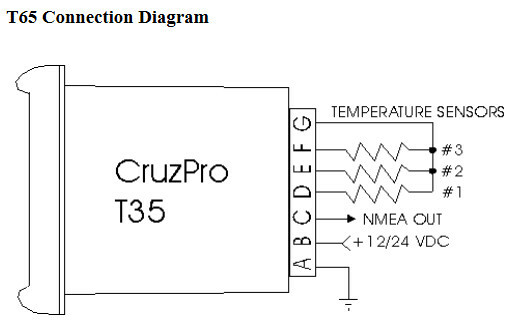 This ASCII information can be used to log performance or repeat the display information at a remote location on the matching CruzPro RP30/RP60 and/or RP110 data repeaters. If NMEA 0183 serial data is not required, then the output terminal can be programmed as an external alarm output pin.